During a visit to HMS Queen Elizabeth in March, Vice Admiral Nora Tyson and her team of US personnel discussed how the UK and US carriers would work together on combined carrier tasks. Vice Admiral Tyson is the first woman to command a US Navy battle group. The US and the UK signed a Statement of Intent in 2012, which set out their commitment to combined carrier strike once HMS Queen Elizabeth becomes operational. Vice Admiral Tyson and her team are assessing how that commitment might be exploited including opportunities to benefit jointly from the F35B Joint Strike Fighter capability, which is shared by the Royal Navy and the US Marine Corps. 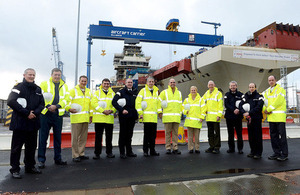 HMS Queen Elizabeth is due to start sea trials next year while HMS Prince of Wales is currently being assembled at Rosyth shipyard. Together the carriers represent the return of the nation’s carrier strike capability.